Share the post "Growing Bloodroot or Sanguinaria canadensis In Your Garden: Tips"
Sanguinaria canadensis (bloodroot) is the only species in the genus Sanguinaria, included in the family Papaveraceae. Sanguinaria canadensis is cultivated as an ornamental plant. This fragile early spring solitary flower develops and rises from the center of its curled leaf, opening in full sun, and closing at night. Plants start to bloom before the foliage unfolds in early spring. Like most members of the Poppy Family, it lasts for a relatively short time. Plant’s unusual shaped foliage is quite attractive. Leaves continue to grow in size after bloom (sometimes to as much as 9″ across) and remain attractive until mid to late summer when the plant goes dormant. The buds of bloodroot can be purple, yellow, white, or many shades of pink though all open to white flowers. Leaves of the wild species vary considerably in shape, color and diameter. The rhizomes grow longer each year, and branch to form colonies. Bloodroot is a carefree plant that multiplies in size quickly and provides a nice carpet of white flowers in early spring. Sanguinaria canadensis blooms at the same time as toothwort, hepatica, wood poppies, and common purple yard violets. Can be planted around ferns (or hosta) with Virginia Bluebells to provide early season interest before the ferns (hosta) break ground. The generic name, from the Latin sanguinarius, means bleeding. If you break the reddish orange root, actually a rhizome, a sap pours forth that looks like blood and even coagulates like blood, hence the name Bloodroot. All parts of the plant contain blood-red sap. There are forms available in the trade with double flowers, and also forms whose flowers are pale pink. The double-flowered forms are prized by gardeners for their large showy white flowers, which are produced very early in the gardening season. The double forms bloom much longer than the normal forms. Sanguinaria canadensis plants are found growing in moist to dry woods and thickets, often on flood plains and near shores or streams on slopes. They grow less frequently in clearings and meadows or on dunes, and are rarely found in disturbed sites. Bloodroot is one of many plants whose seeds are spread by ants, a process called myrmecochory. The seeds have a fleshy organ called an elaiosome that attracts ants. The ants take the seeds to their nest, where they eat the elaiosomes, and put the seeds in their nest debris, where they are protected until they germinate. This wildflower is protected in some states, so you need to check before gathering wild seeds. Common names: Bloodroot, Bloodwort, Redroot, Red puccoon, and sometimes Pauson. It has also been known as Tetterwort. Cultivars: The cultivar Sanguinaria canadensis f. multiplex ‘Plena’ has gained the Royal Horticultural Society’s Award of Garden Merit. • By dividing rhizomes, tubers, corms or bulbs (including offsets) in either fall or early spring. Wear gloves and wash your hands after handling the roots. Rhizomes are easily transplanted. Allow cut surface to callous over before planting. • The most reliable method of propagation is by seed. Plant seeds immediately after collection as they must not be allowed to dry out. Direct sow outdoors in fall. Bloodroot was used historically by Native Americans for curative properties as an emetic, respiratory aid, and other treatments. Even though it has been used medicinally in the past, it can be so toxic (even in small doses) that the FDA warns against using it as a herbal healer. Applying bloodroot to the skin may destroy tissue and lead to the formation of a large scab, called an eschar. Bloodroot and its extracts are thus considered escharotic. Internal use is inadvisable. Applying escharotic agents, including bloodroot, to the skin is sometimes suggested as a home treatment for skin cancer, these attempts can be severely disfiguring. Salves derived from bloodroot cannot be relied on to remove an entire malignant tumor. Microscopic tumor deposits may remain after visible tumor tissue is burned away, and case reports have shown that in such instances tumor has recurred and/or metastasized. Bloodroot extracts have also been promoted by some supplement companies as a treatment or cure for cancer, but the U.S. Food and Drug Administration has listed some of these products among its “187 Fake Cancer ‘Cures’ Consumers Should Avoid”. Other uses: Commercial uses of sanguinarine and bloodroot extract include dental hygiene products. Sanguinarine is included in toothpastes as an antibacterial or anti-plaque agent. The red juice from the underground stem was used by Indians as a red natural dye for baskets, clothing, and war paint, as well as for insect repellent. Fertilizer: You can begin feeding your plants with a balanced fertilizer once they have reached their second year of growth. Toxicity: All parts of the plant are poisonous but the toxins are most highly concentrated in the root after leaves are completely open. May be fatal if ingested! The active alkaloid levels vary greatly between regions as well as populations. The red-colored latex from this plant contains several alkaloids similar to those found in the Opium Poppy, and include sanguinarine, chelerythrine, protopine, and homochelidonine, as well as resins. • In consistently moist conditions, Bloodroot will form dense colonies which are beautiful when the plant is in bloom. Bloodroots spread rapidly and make an excellent ground cover. • Plants may take 2-3 years before flowering size is attained; plants may take 2-3 years to re-establish after transplanting if roots are much disturbed. • Mulch the plants with a thin layer of deciduous leaves during the winter. • Lack of moisture in the summer will cause the plants to prematurely retreat to dormancy, and may reduce next year’s flowering. • Be careful when disturbing the plant; it exudes an orange-red sap that is very long-lasting and difficult to remove from skin and clothing. 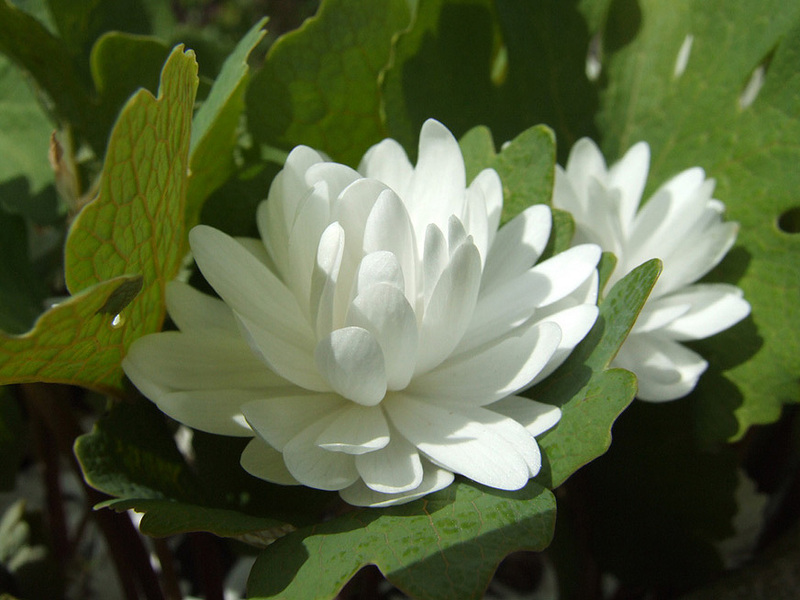 Do you grow Sanguinaria canadensis (Bloodroot) in your garden? What is your experience with this plant? Please share with other fellow gardeners in the comments below! 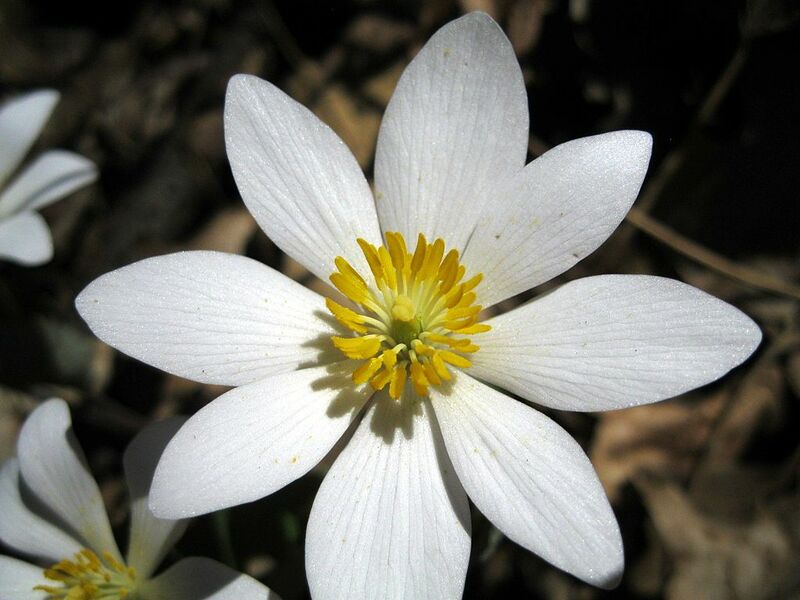 Do you sell Sanguinaria canadensis (Bloodroot) seeds or have plants for sale? You can place your advertisement here. Contact us now! Safety notes: This website is for educational purposes only and is not medical advice, and please check with your doctor before using plants if you are pregnant, using medications or have other health conditions.